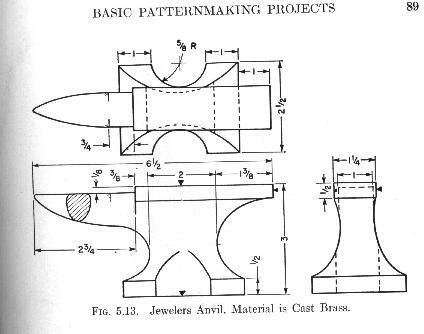 I bought this 6 " long anvil pattern from an antique mall. 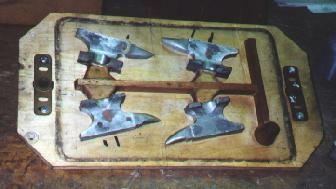 It was marked "Hand Made Anvil" Read my oldtools post about it by clicking here. 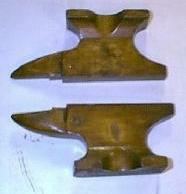 I believe these were made either by apprentices or in vocational schools. 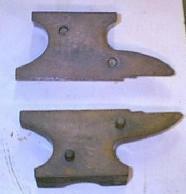 I have seen two similar sized anvil patterns since I bought mine. In the bottom picture the pattern is in the background and a bronze casting is in the foreground. I have now seen three similarly sized anvil patterns! I bought a slightly smaller anvil pattern today at a resale shop! 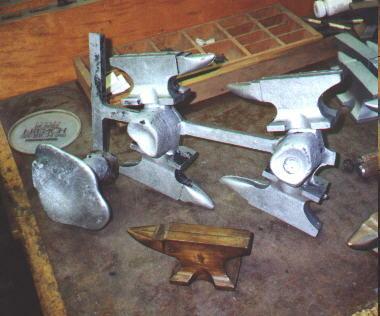 I had the anvil halves cast separately in aluminum. I placed four pairs of them on a pattern board. 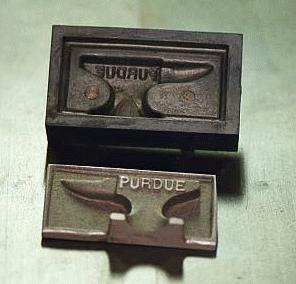 The resulting aluminum casting is shown to the right. 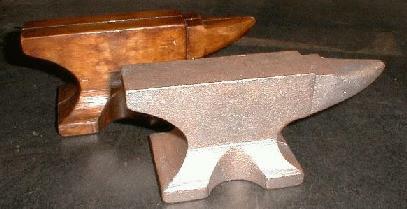 In the foreground is the original pattern and the tip of a bronze anvil casting can be seen the lower right corner. 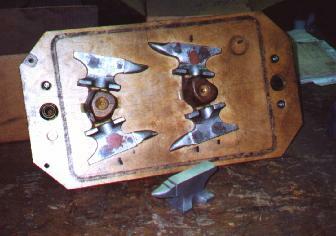 A few cut apart aluminum anvils can be seen in the upper right corner. Here is the top (cope) half of the pattern board. The board is sized for a 12" x 18" flask. Some sort of anvil die? and an aluminum sand casting of whatever the die produced. It's marked Purdue so I'm guessing it was some sort of class project? The die appears to be made out of lead.